Note: Consult your owner's manual for recommended oil type and capacity. 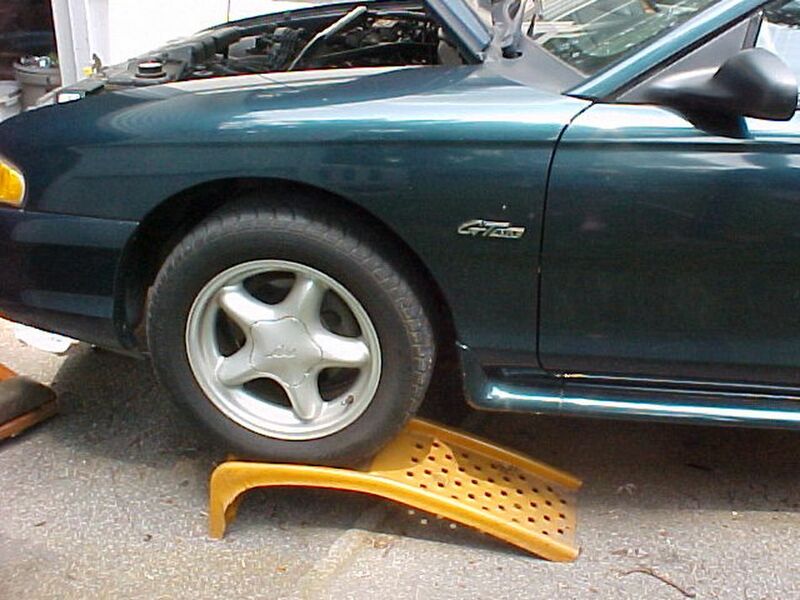 Locate a level, paved area; and raise the vehicle by driving up onto ramps or by using a floor jack and jack stands. Set the parking brake, and chock the rear wheels to prevent roll back. Locate the oil drain plug at the bottom of the oil pan, and place a catch pan underneath it. Then, remove the drain plug, allowing the oil to drain from the engine. After the oil has completely drained, replace the drain plug – being careful not to over tighten. Find the oil filter, and position the catch pan underneath it. Then, remove the filter, taking care not to spill the oil that remains inside. If your oil filter does not have a built-in grip coating on the outside of the canister, you'll need to use a filter wrench to complete this step. Lubricate the gasket on the new oil filter with a small amount of new oil. This will ensure that the filter twists on smoothly, and that the gasket does not break off during installation. Prefill the new oil filter half way with fresh oil to ensure that your engine has oil for the first start up. Then, carefully screw the new filter into place. Tighten by hand until the gasket contacts the base; then turn, one additional turn. Note: Over or undertightening can result in leaks. Open the hood of the car, and remove the oil cap. Then, insert your funnel and refill the engine with oil. To avoid overfilling, hold back the last half quart of oil – a certain amount of old oil will remain in your engine even after it has been drained. Start your engine and allow it to run for one minute to circulate the oil. Then, turn off, and wait an additional three minutes for the oil to return to the oil pan. Remove and inspect the dipstick. Add a small amount of oil if the dipstick reads low. Then, recheck. Repeat until you reach the right level. Note: Be sure to put your oil cap back on, if you had to add oil.